’17 STINGRAY GRAND SPORT: CORVETTE RACING HERITAGE! LINGENFELTER COLLECTION: FAST CARS FOR A GOOD CAUSE! RARE L88 CORVETTES: STING RAY & STINGRAY! 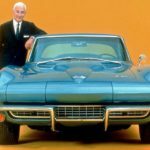 ZR1 & ZR2 CORVETTES: THE MARK OF ZORA! ’64 CORVETTE PROTOTYPE: CERV II!